Actually, I’m cheating a bit, because the situational awareness is not the first thing you should do in a large earthquake; it refers to something that you should have already done before the earthquake starts. 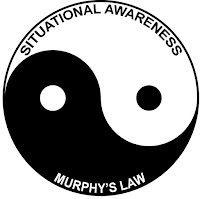 And since you don’t know ahead of time when an earthquake is going to start, you should practice situational awareness as an every-day state of being. This will help you to react to not just earthquakes, but to any unexpected dangerous situation. You’ve heard about situational awareness before, from those poor unappreciated flight attendants who try to tell you before takeoff to look around because the nearest emergency exit might be behind you. In the first few seconds of realization that there’s an earthquake and you need to do something, it’s more important to snuff out that candle than it is to do just about anything else you may have learned about how to react to an earthquake. Unfortunately, you’ll probably be dealing with a bit of panic, surrealness, and even difficulty in moving where you want to move, and the SITUATION that was already in place gets shoved to the fringes of your mind. However, if the very act of lighting a candle brings a quick note to keep in your mind that “there’s a candle burning; extinguish it if anything unexpected happens,” then your situational awareness is already in play and you’ll have a better chance of heading for the candle first, and cover afterward. It sounds like an annoyance but it really takes no extra effort and doesn’t even interfere with your relaxation. After all, the very act of lighting a candle is not brainless; you know to not wave the lit match near a stack of papers, to not put the match directly on a flammable surface after blowing it out, and perhaps to put it in water ASAP to avoid the smoke detector going off. This is just one more thought. Cooking over a gas range is a less hazardous situation because it can’t fall, but it is still a problem in a quake because something might fall into the flame. Therefore, if you have something on the stove and a quake hits, turning off the stove is the first priority; especially important if you went into the other room (and please don’t turn on the stove to simmer something and then head out on an errand, for obvious reasons). I have similar situational awareness thoughts when I have chocolate or grapes or pills out on the counter because I don’t want them to fall in a quake and get slurped up by the dog (chocolate and grapes are among the human foods that are highly toxic to dogs). In fact, you may think I’m obsessed, but I play the violin and whenever I briefly leave my violin in its case with the lid open, I’m extremely aware of what is around it, in case a quake might make something fall on it or might make the case slam shut with the violin not nestled all the way into its protective position. Why? Because I’ve already seen Murphy’s Law in action in that situation (Murphy’s Law—“anything that can go wrong, will” in case you are from a different culture and aren’t already familiar with it—is the Yang to the Yin of Situational Awareness). A few decades ago, I was playing violin and percussion in an outdoor orchestra concert and I left my violin in its open case on the ground near the percussion equipment to play percussion for that piece. There was a pair of bongos on a drum stand roughly 4 feet high, about 4 feet away from my open-faced violin case, and a gust of wind toppled the bongos on a path that was to become both a demo(nstration) of trigonometry and a demo(lition) of my violin’s fingerboard. The damage was actually easily fixable, but I don’t count on being that lucky the next time! It might be useful to do a mental exercise every now and then when you are otherwise unoccupied: what are some other things you might need to deal with first if a quake hits? What if you had something being crunched up in a food processor? What if you were counting or cutting pills on the table (and have a pet)? Are you sitting around with nothing to do bored out of your skull? (Of course not, you're reading this blog! But perhaps later today...) Try running through random situations in your head; what would you do if a quake hit right now? (You might be sitting in your car or walking down the block, or performing brain surgery, etc.) That would be the other part of situational awareness, the random uncontrolled situations where you suddenly might find yourself in the middle of a quake. I was pretty proud of myself in the 1989 Loma Prieta earthquake, because I was outside and instinctively looked up, saw if any electrical wires or tree branches could hit me, saw if any building exterior walls could hit me, determined that a clock tower that was about as far away from me as it was tall was the only thing that could reach me (having a flashback to bongos and an outdoor orchestra concert), and kept an eye on the clock tower and nearby tree branches as I tried to stay standing. Yes, I now know that it would have been better to have hit the ground and made myself small, but at least I had the presence of mind and the situational awareness to assess my surroundings.